To sign up to the Visit Maidstone Newsletter, simply click the Request Newsletter button below and you will receive amazing special offers, discounts and access to secret sales. Visit Maidstone invites you to experience exciting activities, see incredible attractions and to explore the beautiful countryside. Sign up for the newsletter today for all the latest news and offers. Breaks in Maidstone offer the chance to get in touch with nature, family attractions such as Kent Life Heritage Farm and Teapot island will keep the kids happy! Not to mention the vast array of walking and cycling routes to invigorate your senses! 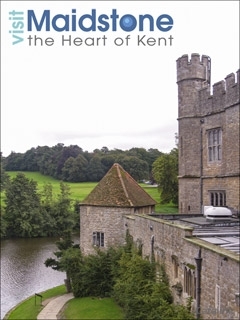 Maidstone is steeped in history and culture, a host of Museums, galleries and beautiful gardens bring it all to life! A must-see on your visit is Leeds Castle... this majestic structure surrounded by pristine waters and acres of lush gardens is quite the sight, a calendar of daily events ensure there's always something going on during your visit too. The fun doesn't stop there! With a wealth of restaurants, bars, pubs and nightclubs you can unwind and enjoy yourself to the max. No matter who you bring there's a fantastic range of accommodation to suit your party. You'll be spoilt for choice! Sign up for the Visit Maidstone Brochure today for inspiration on the trip of your lifetime! By Pressing the Request Newsletter button you give Visit Maidstone (and their Data Processors for the specific purpose of delivering your emails) consent to send you their newsletter via email until such time as you choose to unsubscribe.